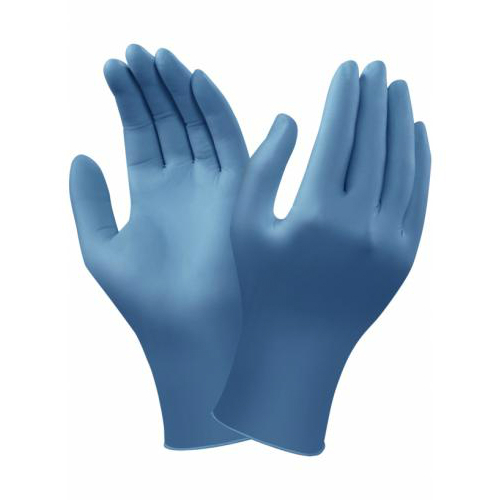 The Ansell VersaTouch 92-465 Dark Blue Disposable Nitrile Gloves are manufactured from an innovative nitrile compound for excellent dexterity, comfort and chemical resistance. Safe for contact with food, powder-free and offering outstanding resistance to animal fat, these gloves are ideal for an array of applications in the food manufacturing and food services industries. Thanks to texturing on the fingertips, the VersaTouch 92-465 Gloves provide excellent grip in dry, wet and greasy conditions. This enhanced gripping ability not only promotes safer handling and enables the user to perform tasks with greater precision, but also reduces the gripping force required during manual tasks, which minimises hand and arm fatigue. The Ansell VersaTouch 92-465 Gloves provide outstanding resistance to animal fats when compared to disposable PVC and natural rubber gloves. Safe for contact with food under European Regulation 1935/2004 and European Regulation 2023/2006, the 92-465 Gloves are therefore a great option for the food manufacturing and services industries. For more information about the food compliance of the 92-465 Gloves, please consult the Food Declaration of Product Compliance in the PDF below. The Ansell VersaTouch 92-465 Gloves are available in a choice of sizes, making them suitable for most users. Please consult the table below for details, then select the required size from the drop-down menu at the top of the page. The gloves have a thickness of 0.10mm and a length of 240mm.